The Hudson H9 is one of those revolutionary firearms that forces you to give it a second look just to be sure you know what you’re looking at. And in fact, chances are good that at first glance, you think you’re looking at a 1911. That forced second glance, however, reveals that this “1911” does not have a hammer. So, it must be more like a Glock, right? But … That doesn't work either because, well–look at it! It's different and is something in between the two. What exactly is the Hudson 9 pistol? Let's take a look. I first got the chance to see the Hudson H9 at SHOT Show, 2017, more specifically on range day. Sadly, I hadn’t had the opportunity to fire it because it was the end of the day and the last of the buses were getting ready to drop us weary, sun-scorched souls off at our respective hotels. I wasn’t about to get stuck out in the desert when I should have been in my hotel, resting for the marathon ahead. Still, I regret not making it up the hill sooner, because I now have to wait until SHOT Show, 2018 rolls around to give a real opinion. I did have the chance to talk to many other folks who had the opportunity, and most of them had raving thoughts about the Hudson 9, how different it was, and a few even said the word “Finally” when they were describing it. I do want to say, in fairness, that not everyone is as excited for its release as we are, but like me, they haven't shot it yet, either. I didn't get more than a magazine or so with the H9 so I don't have a whole lot to say about it besides the fact that I was really impressed by it as a first offering from a new company and found it comfortable and interesting to shoot with a recoil pattern and return to target that made me want to shoot it more. It was certainly less blocky and awkward than it seemed it might be from the initial pics. I also very much appreciated that they were thoughtful enough to start thinking about accessories and aftermarket from day one. I'm looking forward to seeing it actually hit the market because I think it's a platform with a lot of potential. We are told that the 1911 and the Glock got together and had a baby, resulting in this beauty. In a sense, though, the Hudson H9 is more than just a combination of two of the best handguns ever built, and is really nothing like either of them. The overall design of the gun is meant to prevent muzzle rise as much as possible. From the 1911 style trigger, to where you grip the gun, and everything else that has been done, the result was a lesser recoiling gun with a lower bore axis. As you can see from that video, the Hudson H9 is a manufacturing and engineering marvel that completely changed the design of the pistol. The bore axis was dropped when they lowered the barrel and recoil spring, but further than that, the trigger and its guard have been moved up to be inside the gun, rather than simply looking to be added on, like most other pistols on the market. John Moses Browning changed the world with his M1911 and Glock did that again when they made the first commercially viable striker-fired, polymer-framed pistol. Whenever you redesign something, it's going to cost money. Therefore, the Hudson H9 Price is nothing to sneeze at. MSRP is stated to be set at $1147.00, but when you think about it, that's what you'd expect to pay for a quality M1911A1 from a decent manufacturer. 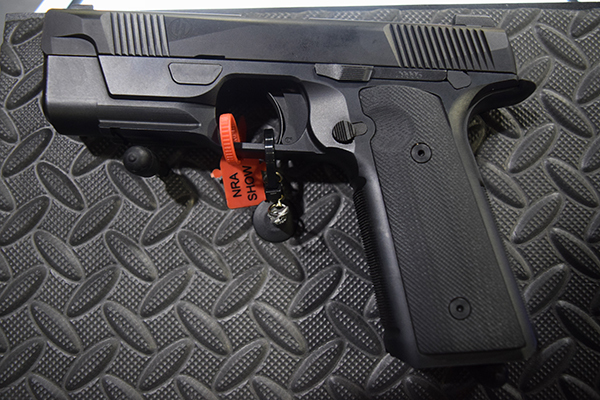 Speaking of 1911s, while the Hudson H9 pistol doesn't come with anything more than a trigger safety, you can opt to install a 1911 style thumb safety, that is supposed to feel right at home for us 1911-loving folks. In conclusion, is this 9mm handgun, the Hudson H9 pistol the next evolutionary step in firearms design? Time will tell, but we are looking forward to finding out starting on June 26th, when they start shipping them out. That above video clip is taken from a Guardian Nation video that was live-streamed to everyone who is a member. All who were there had the opportunity to ask the Hudsons questions, and get them answered right away. GN, as we lovingly call it, is a tactical subscription box on steroids. For the monthly (or annual) fee, you get a quarterly box filled with useful stuff that meets or exceeds the price you pay for your subscription. In addition, you get to attend the live interviews, access to our extensive training library, free in-person classes, and 10% off everything we carry in the store. Oh, you also get some freebies, as well. To learn more about becoming a member of Guardian Nation, and seeing all of the benefits (I did not include them all), hit that link. As a retired military guy whose DOD career started with an enlistment in 1964 after the Kennedy assassination, I’ve never been real fond of the 9mm round. This semi auto may be the firearms version of reinvention of the mousetrap, but the price is way too steep for me, on meager retired pay, to step forward and plop down a bundle of bucks to give it a try. I’m open minded enough to think that many guys may like this new iteration of the 9mm, but personally I’ll wait a little longer to see that all the bugs are worked out. As a guy who has owned and tired a great number of firearms over the past 60+ years, I know that there will always be things that have to be resolved. Personally, I’d like to see this in either a 40 caliber or 10mm for starters. Just personal preference, I guess. Where and how do I try one out? I got to ihave one for my collection if it works out. Will a .45acp model be available? Are you going to feature other calibers in the NEAR future? If not why? At this point, we don’t know if they will be releasing other models. I do believe I heard them say they wanted to. They are releasing the H9 at the end of this month so try to get on your FFL’s case about getting you one. Thanks for the comment. I am the coach of a collegiate Pistol Team and Cy Hudson, the owner of Hudson Manufacturing, was a member our school Pistol Team during his college days. That shooting experience plus his time in the Army as an Infantry Officer have given him great insight into what a defensive firearm should be – all of which he has applied to the design of the H9. I had the opportunity to shoot the H9 at SHOT. As a coach and competitive shooter I own multiple 1911s, Glocks, and other fine pistols so I have no bias for one over the other. The H9 trigger is light and crisp – like a great 1911 trigger. The reset is incredibly short and fast.. The bore axis is very low in relation to hand so muzzle flip is almost non-existent. The lack of muzzle flip and short, fast trigger reset make for fast and accurate follow-up shots. The intial offereing of the H9 is a bit pricey but it is oriented toward the shooting enthusiast – shooters who want the advantages of the H9 for competition or serious defensive applications. Knowing Cy Hudson as I do, I’m sure other variations of the H9 in other popular calibers, including entry level versions, are already in the design stage. I have two H9s on order and am looking forward to putting a lot of rounds down range with these incredible pistols.